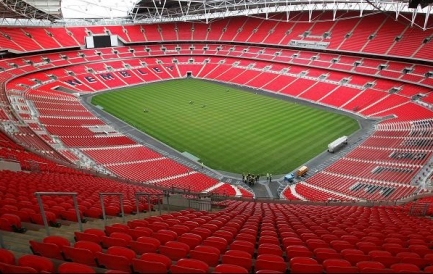 Wembley Stadium tickets are extremely popular and in high demand. The Empire Stadium in Wembley, popularly known as Wembley Stadium, was the most famous football ground in the world. Because England was the birthplace of the modern game and shared with Scotland the founding role in international football, Wembley, as it evolved into England's national stadium, gained worldwide regard as the citadel of football and as hallowed ground. After England began playing teams other than Scotland at Wembley in 1951, the world's national sides considered an invitation to play there a great honour. England played 223 matches at old Wembley. They played the other home countries there every other year as part of the British Championship, Scotland since the 1920's and Wales and Northern Ireland since the 1950's. For that reason, Scotland played the most matches against England at Wembley, 30, followed by Northern Ireland, 18, and Wales, 16. Outside the home countries, Brazil and Germany/West Germany led the way with nine matches each. England played 51 representative teams at Wembley. Two of those teams, the Rest of Europe and the Rest of the World, were not national selections, but representative sides consisting of players drawn from several nations. England thus played 49 national teams at Wembley, although that number is smaller by two if predecessor and successor nations are lumped together (united Germany and West Germany, on the one hand, and Czechoslovakia and the Czech Republic, on the other).